If you like monkeys that attack during selfies, awesome editing with fire, an anti-climactic coffee tasting and synchronized swimming… look no further and click play. And if you don’t have a lot of time, just skip to 7.17 for the synchronized swimming. Because that is something you don’t want to miss. For more about the adventures in Bali, read this post! I went to Bali a few weeks ago and the thing that keeps haunting me is that I am not done there, at all. I need to go back, many times. Or one long time. Or several long times. The point is, I want to go back. I went there this December with my brother and his girlfriend. We arrived with the fast boat from Lombok and as soon as we got off the boat, people were bothering us and showing us all the items they had for sale. Food, mostly. Welcome to Bali. We waited for our bags to be unloaded and when they were we looked for our shuttle bus to Ubud. We found it quickly and even as we were inside the bus, they kept showing up with products. And here is where it gets really funny. Because you would think, that when you buy something, they will be happy and stop bothering you. BUT NO! I bought a packet with some pineapple and watermelon, because… well, because why not? I love fruit. But instead of selling it to me with a smile, she tried to sell me two, or even more. And when I didn’t want that, she listed some of the other products I could buy. “Da da Ibu”. The drive to Ubud was nice and when we arrived, we got dropped off in the parking lot of a supermarket. Our accommodation was 3 kilometers from there, and I wasn’t in the mood to walk with my backpack. I figured we could just hail a taxi. But apparently, that is not how things go around Ubud. There were no regular taxi’s driving around, I didn’t see any ojeks (motorbikes with drivers). So I was a bit confused. I called Blue Bird and when I finally got the right number for Ubud, they told me it would take 30 minutes before we could get a taxi, because they had to come from Denpasar. I was surprised, because why would there not be any Blue Birds in Ubud. Later, I learned that the local government (or King of Ubud, or Sultan, or just the Mayor, whatever) is keeping them out of the city. There are a lot of local taxi’s and otherwise they would be out of business. We found out later that Uber is active there, so that saved us some money in the upcoming days. Anyway, we decided to walk, because when we asked what the price would be to take us 3 kilometers to the north and the guy replied with a price that was way way way way too expensive, we went off. And on the way, a lot of people asked us if we needed a taxi. We kept saying, yes, but for this and this price and after five minutes we found somebody who would at least take us for a sort of reasonable price (and that reasonable price already went up a lot since we arrived and had to forget about the regular prices for a taxi). So he disappeared around a corner, and came back a few minutes later with a car. We were hysterical, because it was all so shady, but it seemed the most normal thing in the world there. We had to walk along a path through some bushes and along rice fields (we even crossed a small stream), but when we finally arrived, the view was amazing. We were right next to a rice field, the villa was everything you could imagine and when our host started cutting up some fresh mango and pulled out three bottles of water from the refrigerator, we never wanted to leave. 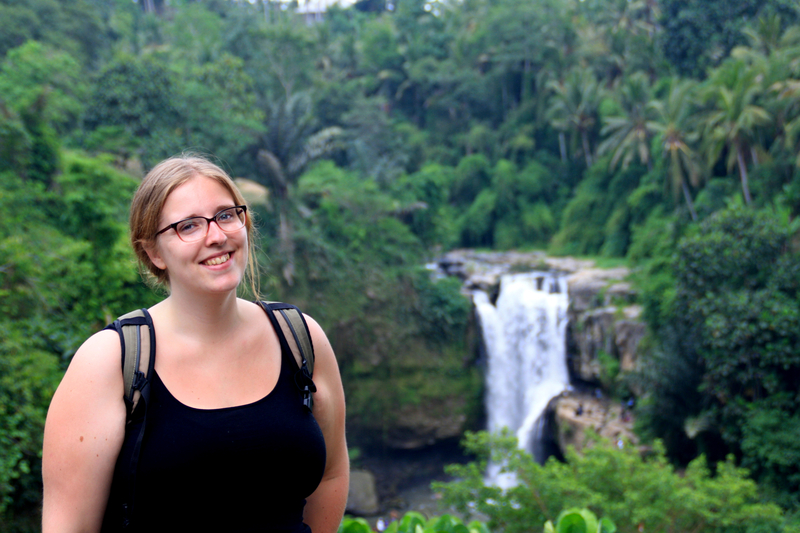 In Ubud, we did some of the touristic activities that one must have done in Ubud. We went to the Royal Palace, we went to the Art market (which is just a huge place where you can haggle and buy souvenirs, don’t let them fool you with a fancy name) and we went to the Monkey Forest. Surprisingly, I had so much fun at the market. I did not plan on buying a lot of souvenirs and I knew this meant some serious discipline, but when I got there and I started haggling in Indonesian, impressing the seller and myself, I just had the best time. I bargained for sarongs and small statues and all the other things one wants to buy there. And not just for me, but also for my brothers girlfriend (my brother did not suffer from MSD – a.k.a. Mad Shopping Disease). The highlight was when I wanted to buy this small wood carved statue of a monkey sitting on some books. I had seen it in several places already. So, I decided to just ask what the price was. He said IDR 600.000. Uhhh. No. And so the game begins. I finally got it for IDR 300.000 which I thought was a pretty good deal (20 euros). But what made my day came next. He told me, in Indonesian (so just the fact that I understood made me smile with pride), that for tourists he would normally start with one million rupiah, but because I spoke Bahasa Indonesia, he started at a lower price. We had some plans to do a yoga class and a cooking class in Ubud, but we didn’t do it in the end. So when I go back to Bali I will spend at least two more weeks in Ubud. I want to eat at all the vegan restaurants, do a cooking class, go on a yoga retreat, rent a motorbike and explore… And many other things. On our last day in Ubud, our host drove us around the island a little bit. We went to a coffee plantation where we had a small tasting, we saw a huge mountain, we went to a very popular rice field (which made it all the more unattractive) and we went to this amazing waterfall (where the stairs made me realize I am not exercising enough). It was a great day where we got to see some of the island of Bali and in the end the driver dropped us in Denpasar, where we were spending the next two days. On the first day in Denpasar (Seminyak, to be exact) we walked along the beach. I found a seashell (yay) and we had a very expensive lunch in one of the beachside restaurants. We figured we would check out the central square (sort of) after that, but there was not much to do and all the tourists made us kind of crazy, so we went back home for a dip in our private pool and to relax. I also want to share a joke that the waiter at the restaurant made. When we were finished and were about to leave, we asked the waiter where the toilet was. And before I continue, let me just stress that the restaurant was very fancy and expensive. And he just flat out told me that they did not have a toilet. He looked so serious and then told us that we could go outside and around the corner. I think I may have had an annoyed look on my face, because toilets in Indonesia are always so much trouble and I saw it coming. But then he started laughing and told me he was joking. And I totally saw the humor in it because it was very funny and playing into one of the worst fears of their customers, no doubt. At the end of the afternoon we wanted to go to Tanah Lot to see the sunset. It’s supposed to be amazing there. We got a taxi at five o’clock, but didn’t realize there is only one way that leads in that direction… and it was full of cars. People use that road to go home after work and it leads to a different area of the city. As you may guess, this story ends with a sadly missed sunset. We arrived there when it was already almost dark and by the time we reached the view… There was nothing left to see. The next morning we went to the DMZ, where they had 3D trick art which made for some amazing pictures. It was raining very badly that day and after the museum it was time for me to say goodbye to my big brother and his girlfriend and go back to Jakarta. When I went back to the airport by Uber I felt pretty awesome. My Uber driver was very nice (offered himself up if I ever need a boyfriend in Indonesia) and at the airport I sat and ate some lunch/dinner by myself and I was walking around the airport like I knew the place. Security was a breeze, because by now I know what to do there (and they are just not as secure here as what I am used to) and watching everybody else struggle really made me feel good about myself. It gave me a great ego boost for my upcoming travels and I look forward to that every day. But for now, I will enjoy more of Indonesia and I am already writing a list of what I have to do here when (not if, when) I come back at one point in the future.